11/19/2013 - Intimidation Bolt is just begging for an adaptation using fight. I really like where you're going, but I think both of these are near misses for the same reason: They lead to weird "gotcha" moments. The first can accidentally fog yourself (which will happen to new players), and the second giving your opponent's creature intimidate is really weird. The first is easily fixed by saying "Creatures your opponents control can't attack this turn." The problem is, I don't think that ability is RG, I think it is W.
The second I think would be far cleaner if it was Soul's Fire instead of fighting. I think it is also thematically cleaner. Another option that stays in color pie is to staple the original fight to Falter. For such a clean theme, it is difficult to get the rules text to tell just the right story. I felt fine giving both creatures intimidate, because whichever one survives the fight will be scarier. It also doesn't matter if the opposing creature gains intimidate on your turn. I'd be fine giving it just your creature, but it takes surprisingly more text. Yeah, I definitely see how your way made fewer lines, but I still think a new player would find it weird. It is unfortunate fights don't have a "Winner" that you could reference! "Target creature you control gains Intimidate and fights target creature you don't control" is shorter and most of the time your creature is going to be the survivor anyway so the story should be the same. I considered that, but it is in the wrong order thematically. He is scary after he rips that Wind Drake to pieces, not before! It wants to be: "Target creature you control fights target creature you don't. Your creature gains intimidate [if it survives]." The problem isn't the optional "if it survives" but the fact that "your creature" isn't Magic. "The creature you control gains intimidate" works but it takes so much wind out of it. Plus, it actually hurts the story: Whichever creature comes out on top will be the scary one. Since players are only going to cast it when they expect to win, why bake that part in? Tangentially, "if it survives" actually changes nothing. Neither creature dies until after the spell finishes resolving and damage is checked as a state-based effect. Card effects go in chronological order, right? 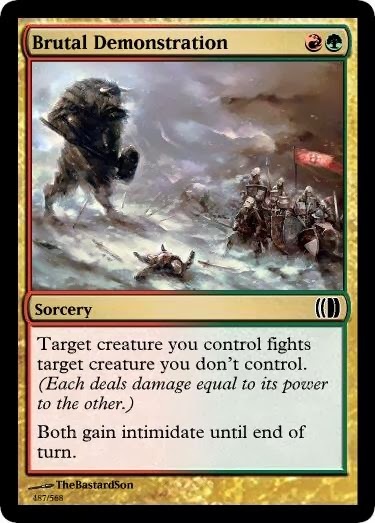 I don't see why the second effect couldn't be a Fog variant (Terrifying Presence variant, to be exact: "Prevent all combat damage that would be dealt by other creatures this turn. "), which are as green as it gets. Giving two creatures on opposite sides of the battlefield intimidate until EOT feels inelegant because intimidate doesn't matter for the defending player. When thinking about how the flavor matches the mechanics, I think it's okay to think about how cards will be played 99% of the time. It's okay for Last Kiss to have its name even though it's possible to play it twice on the same creature. 99% of the time you are using it to kill a small creature, so the flavor fits. Similarly, you're unlikely to pick a fight you're going to lose (obviously you can lose to tricks), so it's okay to give your creature intimidate only because the assumption is that you're going to win the fight. I really do dig the flavor of this, though. All it's missing is the Gruul watermark it rightly deserves. It's interesting that we're both using the same reasoning to justify different ends. Both creatures gain intimidate until end of turn. Most of the time you're fighting to win, but this way you can have your creatures brawl each other to demonstrate dominance! The story is clean, and the words work out, I think. 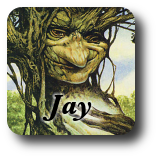 I have 0 problems granting an opponent's creature Intimidate - it's like Incite making the creature red. This is a fun card all round.